Google has expanded the scope of Gmail’s phone calling feature, reducing the cost of international phone calls and making the feature available in 38 languages. 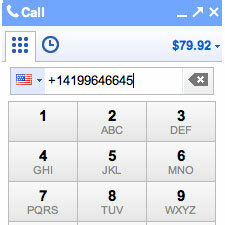 The product, which is powered by Google Voice, will be rolling out across the world in the next few days. A green phone icon will appear in a user’s Gmail account once the voice calling feature is available in his or her country. The search giant introduced voice calling in Gmail in August. In addition to the international rollout, phone calls will be getting cheaper for calls to more than 150 locations around the world. “For example, it’s now only $0.10 (or €0.08) per minute to call mobile phones in the U.K., France or Germany (landlines are $0.02/min), $0.15/minute to call mobile phones in Mexico and $0.02/min to call any phone number in China and India,” Google product manager Pierre Lebeau explained in a blog post. For those of you who use Gmail phone calling to call your friends or colleagues in the U.S., you don’t have to worry; phone calls within the U.S. and Canada will remain free until the end of 2011.